Flora Dora Cottage is an original fishermans cottage built over 200 years ago and is situated in the heart of Filey on the historic Queen Street in Filey. Less than five minutes walk from the beach. The cottage has just undergone an 18 month renovation, bringing contemporary style while retaining many of the original features. 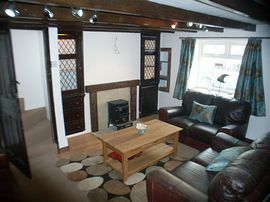 Downstairs LOUNGE - Beamed ceiling three leather sofas, coffee table, Flat screen HD TV with Satellite channels. Quality sound system with IPod dock, DVD player selection of DVDs and CDs. KITCHEN-DINING ROOM - Modern gloss cream kitchen units featuring Halogen Hob and electric fan oven, Microwave, Integrated dishwasher, Fridge. Dolce Gusto Coffee maker. 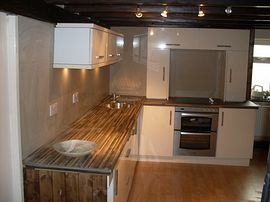 UTILITY ROOM-Automatic Washing machine, Tumble Dryer, coat storage. Upstairs BEDROOM 1-The largest of the three bedrooms full of character with exposed stone wall, vaulted ceiling with original beams. King size oak bed, oak wardrobe and drawers. BEDROOM 2-Oak frame single bed. Vaulted ceiling with exposed beams concealed lighting 5 drawer chest. BEDROOM 3-Double bed, 5 drawer chest, hanging rail. En-suite Shower WC and Basin. BATHROOM- Bath with shower WC and Basin. Outside Small yard with BBQ. Large garage complete with everything you need for a day on the beach: buckets, spades, fishing nets, body boards and wetsuits, Cricket set, football, deck chairs and wind break. Just for the boys- an original outside privy complete with a fine selection of reading material. The ideal place to get some peace and quiet! Please note Flora Dora has a very steep and winding staircase, which may be a problem to elderly or less able people. Filey will soon to be better known as Sugartown in the new BBC comedy drama, set in the town staring Tom Ellis, Georgia King and Sue Johnston. Flora Dora was home to the Director and Producer during the 10 week of filming. 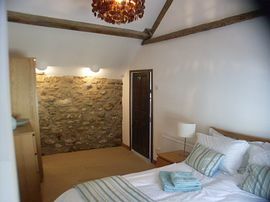 This luxury holiday cottage is available for weekly bookings and short breaks. From: £230 for a short break to £950 for a peak week in Summer.